If you have gotten massage at Anthrocon in the past several years, you've likely met Amy Thacker. She and her friend Johnny have been coming to AC to set up for massage therapy for a while now, and she's an amazing massage therapist and good friend of mine. Some of you have experienced her skilled and magical hands, been helped and healed by her knowledge of the body. I wanted to let you know about her upcoming office space in Virginia, and share this in case you can help out! Survey for a possible exclusive chartered trains to sellected cons/meets. Please go here and voice your opinion. The poll is to FC, but if there is enough interest there will be train added for other cons. Going to AnthroCon this year and want a new badge? Or a new way to showcase your fursona? We may have something just right for you! IdentiFUR is open for Fursonal IDs™ & Fursonalert™ Badges (Hugs Edition)! Please visit our website for prices and more information. Note: If you're wanting an ID or badge done in time for the convention the last day to order is June 14, 2015. After this date we cannot guarantee it to be done in time of the convention. Permission is granted for noncommercial use of photos which you appear in. Secret Society Badges for Anthrocon! Secret Society Badges with a twist to their design! Mini charms that you can clip to your main badge. 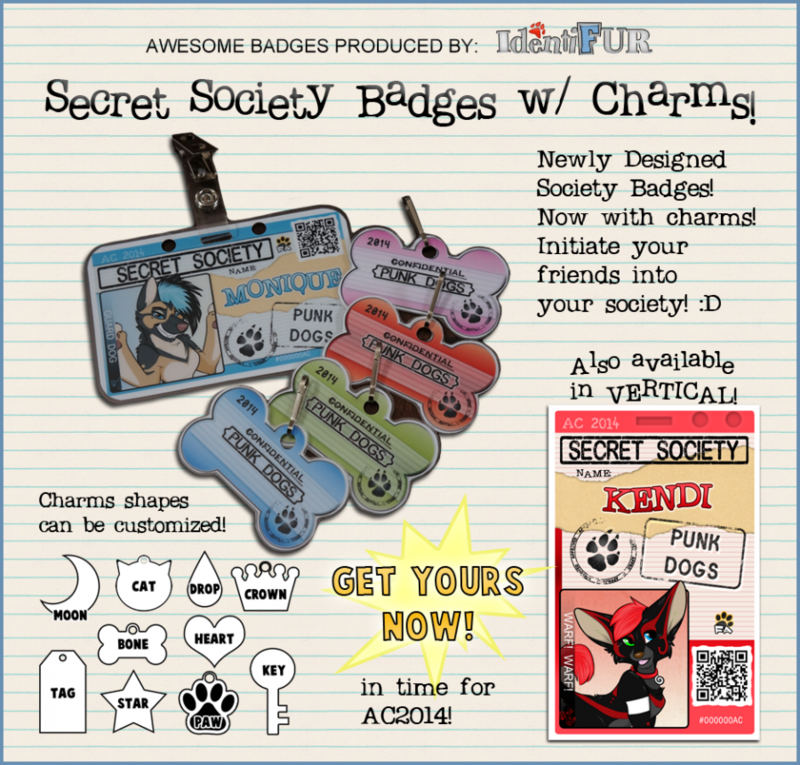 You can use these charms ( with your societies name on them ) to tag and add your friends to your secret society by clipping it to their lanyards ( or wherever they fit nicely ). Highly customizable shapes, these initiation charms can be ordered in 4,6,8, or 10 with your badges. Since these are all hand made, it's the highest number we can offer. Anthrocon seeks writing and artwork for conbook. Deadline May 3, 2014! 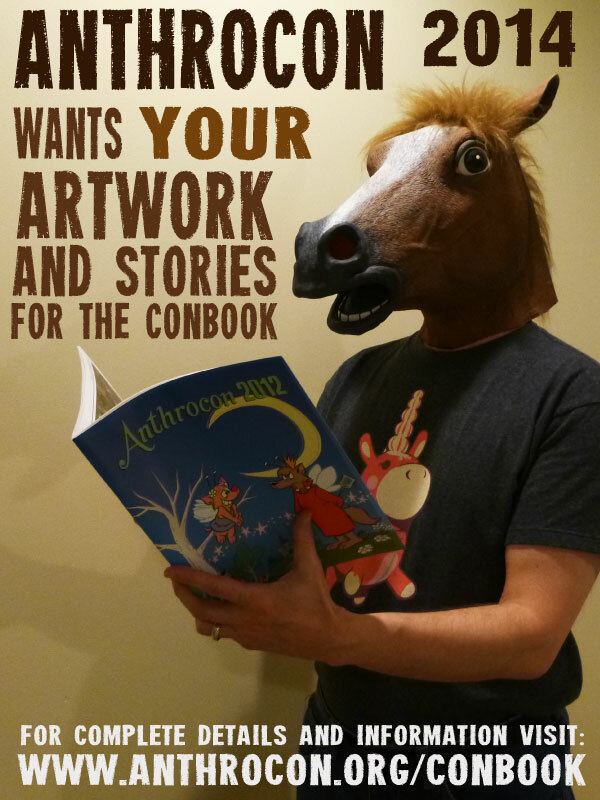 ANTHROCON 2014 is currently seeking submissions of artwork, stories, photography, poetry, and articles for its conbook! The Anthrocon conbook offers a fantastic forum for artists and writers to showcase their talents to their peers. To make contributing to the conbook easier, a file-uploading site is available. Anthrocon asks for non-exclusive print rights for submitted works. The artist or author may publish the submitted work in any other fashion; previously, at the same time, and after. While we welcome any submissions of most any nature, please be aware that priority may be given to those works that complements the theme of the convention, "SECRET SOCIETIES." All submissions should be in the 'G' to 'PG-13' rating. Deadline for submissions is MAY 3, 2014. I would like to wish firewolf66 a happy firey wolf day and I do hope you enjoy your wolf day until you howl yourself into another year older. If you ever wanted to appear in a comic book, this is your chance! I'm raising funds to print Volume Two of Last Res0rt, and I'm offering cameos -- they come with badges to make sure I'm drawing your character right, so it's like a huge multi-part commission of your character(s)! You can pre-order the books too, but this offer for cameos is only running during the kickstarter -- so check it out today! After doing nothing but working on videos and photos for a week after returning from AC, I've completed my entire video library from the convention :) As it is every year, AC is just a blast in every way and I always look forward to being able to share the magic of this convention with you guys. Click on the titles to go directly to the video page, and descriptions are below. This one is my favorite to do each year (but also the most work), my annual compilation of the best fursuiting moments I was able to capture at the convention to a great beat - Krewella's Alive (Jakob Liedholm remix). Thanks to the awesome ChaosReign who tagged along with me to AC this year, I was able to get a lot of great footage of a certain Hawaiian Lion fursuiting around the con. From impromptu games of "keep away" with my plush zebra leg to entertaining local Pittsburgh kids on the street, there's nothing like fursuiting at AC! Most of the footage also features my friend Rygar as the ultra cool Singha Lion. This is a truly amazing story that has gotten the Furry Fandom an extraordinary amount of good press, and it couldn't have happened to a nicer and kind-hearted individual that welcomed, with open arms, an often-maligned group of people to the city many years ago. SARDYUON!!! Need I say more? In case you missed it, here's the fantastic fireworks display that kicked off the convention on July 4, as viewed from the balcony of the David L. Lawrence convention center. It was an incredibly long show (over 24 minutes), and the finale was one of the best I've ever seen. Closing ceremonies at AC is always a bittersweet time as we celebrate the weekend's incredible successes, but are saddened by the end. This video features highlights including total numbers for fursuits, registration, Guest of Honor reflections on the weekend, and last but not least the amazing amount of money the furries raised for the 2013 charity, Equine Angels Rescue. Furries are passionate people, whether it's costuming, art, writing or even gaming... so why not use that passion to help others? This great panel featuring Wolfpup TK (Furs 4 Life), Yippee Coyote (Critters by the Bay), and Ty Fusky discusses the many ways that furry fans can get involved in charity work and improving the communities and world in which they live. At the AC Masquerade this year the always impressive Sardyuon tried a different kid of act, simply called "Physics." It may have been an excuse to TP the stage, but not without entertainment value! Masquerade regulars Provo Cheesebeagle (Cheesio), Tigris, Royce and Sharky came up with a clever skit to fit the "Fast and Furrious" theme, during which a drive test goes horribly awry. Always fun to see what this team comes up with year after year! One of the most talented musicians the furry fandom has to offer, Rhubarb delighted the crowds at AC's annual Masquerade. His stage time was cleverly scripted as he had to pass an impromptu "rehearsal" to open up the show, and was brought back later. After last year's fantastic performance, the Lucifurs are back in a big way with an impressively choreographed and high-energy dance routine. As always a real treat to watch this group tear up the stage with their swag! The Fursuit Dance Finals at AC is the best of the best in the fandom at their craft, and the finals this year was absolutely packed with talent. This event is absolutely one of my favorite parts of AC weekend! Each of the 20 fursuit dancers in the finals of the prestigious AC 2012 Fursuit Dance Competition rocked the stage, and I pay homage to their talent with this unique highlight reel compilation video that features each of their awesome dances.